“You are engaging in cyberwarfare, on the side of the good guys.” –Hillary Clinton, on USAID and State Afghanistan media development programs. On my Portuguese-language blog, I refer to them as «admiráveis internautas novos» In other words, what Web is this, that hath such creatures on it? The principle challenge of this little Web-crawling project of mine is to see whether what crawling followed by social network analysis in Pajek points to as part of a networked organization or organizations corresponds to real-world relationships. 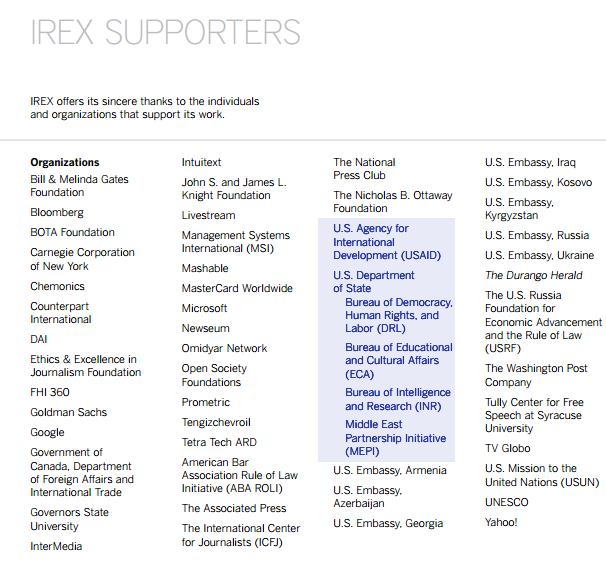 In the case of IREX, relations discovered by crawling the content of the organizations Web site, above, corresponds to the financial disclosure — disclosure of sponsors, if not financial details — in IREX’s annual report. The alliance of governments with media & tech industries and their respective philanthropies extends to others of its kind, such as the Knight Foundation’s many journalism education and incubation projects and other international NGOs with the same or related missions. In Brazil, the oligopoly TV Globo counts as a supporter. In my recent note for Brazlian readers — those who can forgive my atrocious abusage of subjunctive clauses — I summarize a recent report from the National Endowment for Democracy’s CIMA, the Center for International Media Assistance. What I set out to describe for Brazilian readers is a sense of the middle ground where journalism and infotainment curricula and strategy are negotiated, as above. A note on interpreting these «netograms» of mine, drawn using the network analyis tool yEd: Once these subnetworks have been discovered in Pajek and reformatted in Gephi — yEd only reads Excel 2000/XP matrices — their nodes are grouped according to structural properties, which mainly turn out to be based on organic centrality. Each natural grouping is laid out using the organic clustering tool and identified according to its principal — most central or most often cited — member. If what the member nodes have in common is a tie to some social platform, the group is named for that platform and marked with an asterisk. In some cases — including networks crawled with NaviCrawler — the crawl will produce, say, an atlas of Twitter accounts with substantive content in common. 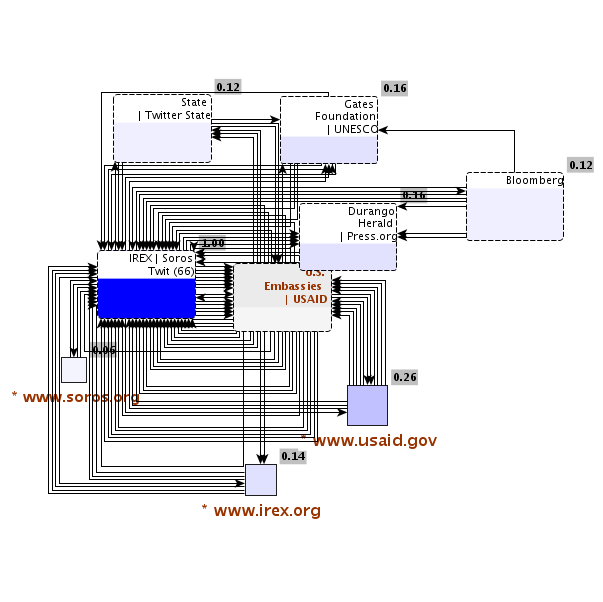 In the diagram above, then, we see the summarized relations among the entities ANJ, IFEX, ABRAJI and SIPIAPA. 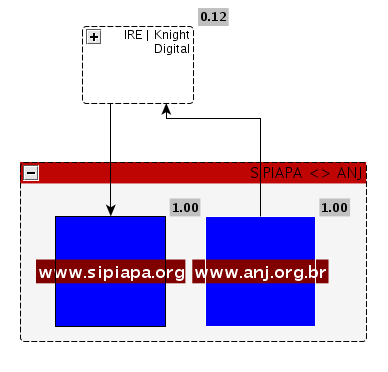 ANJ is a national newspaper society in Brazil, IFEX an international freedom of expression exchange, ABRAJI a Ford Foundation-funded investigative reporting project in Brazil, and SIPIAPA a Latin America-wide press association. 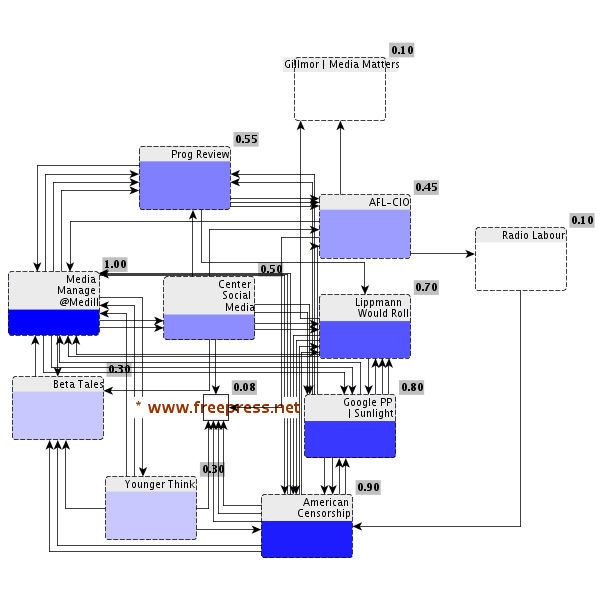 These nodes, connected in turn to projects international in scope — World Associatij of Newspapers — represent a hierarchical structure corresponding in part to its brokerage roles in the graph of linked sites. Projects fed by the U.S. government and homegrown tech sector philanthropies occupy a strategic position in the influence game — the circulation of shared ideas and techniques is anglocentric and unirectional for the most part. And so on. One interesting bit of analysis from Anne Nelson is her description of a relatively new player — an incubator –in the international media and media tech development front. 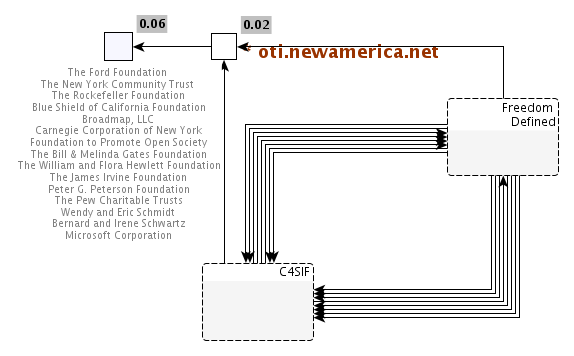 One major new player is the New America Foundation, founded in 1999, with seed money from Bill Moyers’s Florence and John Schuman Foundation; Google executive chairman Eric Schmidt serves as chairman of the board of directors. The foundation’s Open Technology Institute, headed by Sascha Meinrath, has become one of the most influential think tanks and laboratories for digital policy in Washington, as well as the generator of highly regarded projects in digital media development. 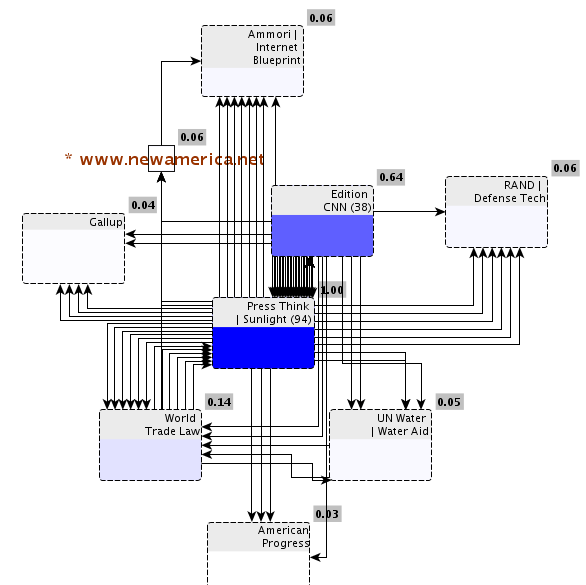 Along with technology incubation, the foundation is active in international affairs and national security. It seems to overlap, mission- and personnel-wise, with the prioneering Berkman Center at Harvard and the Electronic Frontiers Foundation. New America has joined forces with FreePress.net to promote a– yet another — «declaration of Internet freedom».